However, the advanced agenda for the Shadow Cabinet meeting which is also scheduled for today showed no plan to discuss the issue, according to the Jewish Chronicle. Yesterday the National Executive Committee (NEC) made the decision to adopt the International Holocaust Remembrance Alliance (IHRA) definition of anti-Semitism along with all its examples. However, the NEC has faced backlash for also passing a statement of clarification that the changes do “not in any way undermine freedom of expression” on Israel or the rights of Palestinians. Campaigners said the party seems “determined to provide a safe space for anti-Semites” and adding such a caveat to the internationally accepted definition just gives racists a free pass. Labour Friends of Israel director Jennifer Gerber said: “It is appalling that the Labour Party has once again ignored the Jewish community: that it should adopt the full IHRA definition without additions, omissions or caveats. 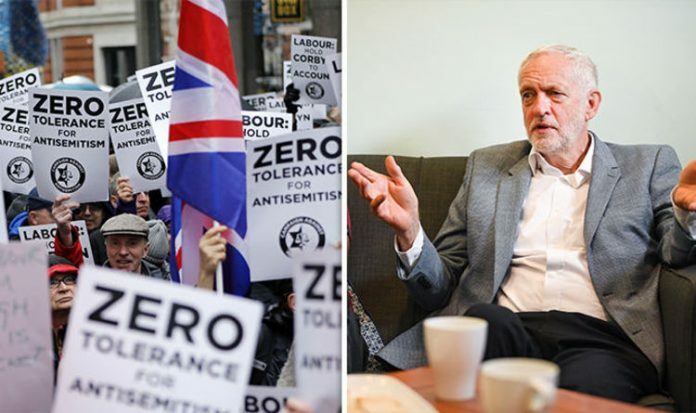 Labour leader Jeremy Corbyn has himself been under fire for his handling of the anti-Semitism problem, especially for calling for the NEC to accept a clarification that it should not be considered anti-Semitic to describe Israel as racist. Labour Friends of Israel have declared that Mr Corbyn is “part of the problem, not the solution”. Jewish Leadership Council chief executive Simon Johnson said: “It has now become absolutely clear that the leader of the party attempted shamefully to undermine the entire IHRA definition. Reports of the NEC meeting describe it as a “shambles”, because the exact phrasing of the clarification had not even been decided by the afternoon of the meeting. Labour Against Anti-Semitism said the move “appears to be protecting the freedom of racists to present vile views”. A Labour Against Anti-Semitism spokesman said: “There can be no caveats, no conditions and no compromises with racism. “We are disappointed by the decision of Labour’s governing body, the NEC, to diminish the IHRA working definition of anti-Semitism via the attachment of a ‘clarification’ that risks giving racist in the party a get-out-of-jail card.